Staff will be present to monitor the safety of students exiting vehicles and entering the building and to direct traffic in the parking lot. After turning onto Woodbrook Ln. from N. Charles St., vehicles should enter the parking lot through the 2nd entrance on the left. Upon entering the parking lot, vehicles should turn left immediately and come to a stop in the traffic line as directed. Each vehicle should pull as far forward as possible along the curb before coming to a stop in order to avoid traffic backing up in the parking lot and on Woodbrook Ln. Upon exiting vehicles, children should proceed as directed into the building as quickly as possible. Once children have completely exited a vehicle, drivers should NOT proceed until directed to do so by a staff person. Vehicles must proceed as directed along the east wing and up the hill to the south exit where they must turn right onto N. Charles St., to ensure safety and smooth traffic flow. Staff will be present to monitor the safety of students exiting the building and entering vehicles and to direct traffic in the parking lot. After turning onto Woodbrook Ln. from N. Charles St., vehicles should enter the parking lot through the 2nd entrance on the left and then proceed straight ahead to the parking lot behind the building where they will be directed to form several parallel lines. Drivers should place their family name card on the dashboard, a visor, or other location that makes the name card easily readable from the front by staff. Once vehicles come to a stop, engines should be turned off. As many cars as possible will be dismissed, once the first round of children is safely in the vehicles. Vehicles that are still waiting to pick up students should slowly move forward and form lines as directed for the next round of students. Engines should again be turned off until a signal has been given for vehicles to begin leaving the parking lot or to move forward in the lines. 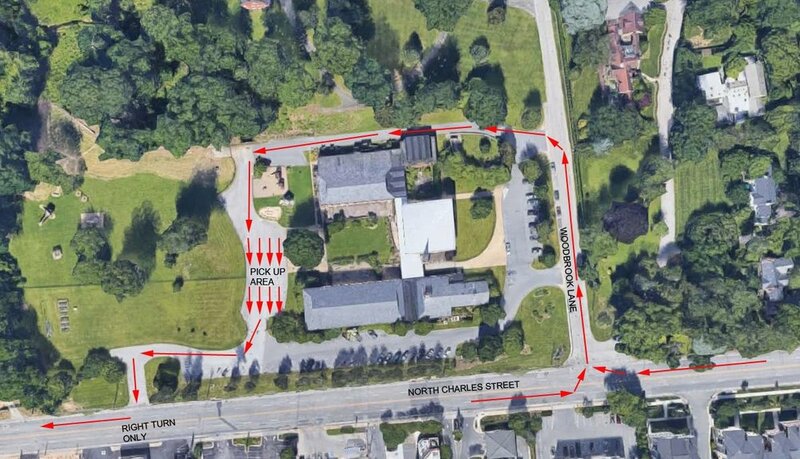 Upon exiting the parking lot, vehicles will be directed to proceed uphill to the south exit, where they must turn right onto N. Charles St., to ensure safety and smooth traffic flow.